The powerful wet/dry, ARC 5-blade system combines personalized shaving performance with multi-blade precision to gently cut through facial hair for consistently smooth results. Ultra-thin, ultra-sharp Nanotech blades and ARC foils are forged from premium Japanese stainless steel. 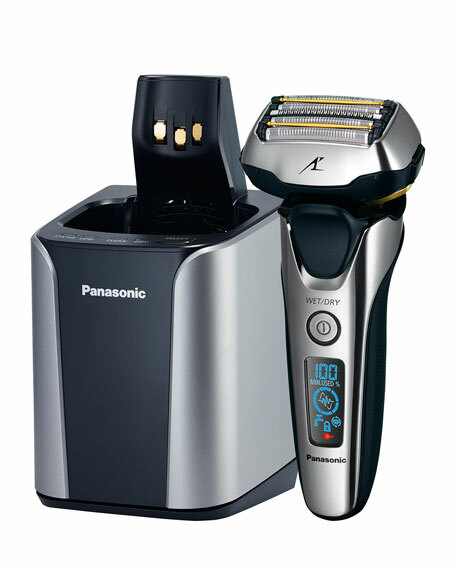 Includes 10-stage status LED, pop-up trimmer and travel pouch. As you shave, an advanced 3D Multi-Flex Pivoting Head flexes up-and-down, side-to-side and back-and-forth to follow the individual contours of your face, neck and jaw for the ultimate in close, personalized comfort. Three micro-thin, hypoallergenic ARC foils and dual, super-smooth skincare rollers work together to provide an exceptionally close shave. The Finishing Foil captures and cuts stubborn hairs. A Lift-Tech Foil uses reverse-tapered edges to lift, hold and cut flat-lying hair. The Quick-Comb Blade is specially angled to catch and cut longer hairs. Two Skincare Rollers help reduce friction on the skin for a more comfortable shave. 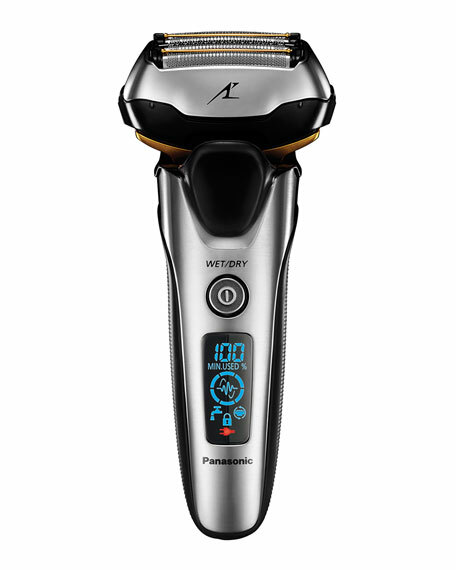 Powered by a high-efficiency 14,000 CPM linear-drive motor, the Panasonic Shaver also features a Beard Sensor that automatically adjusts power levels to match varying beard densities on the face, chin and neck. And when shaving is done, a pop-up trimmer adds the perfect edge to sideburns and mustaches. When you're in a hurry, the shaver provides a quick, smooth dry shave. And, because it's designed to be 100% washable and fully immersible in water, it performs just as efficiently in the shower or over the sink using your favorite shaving foam or gel. 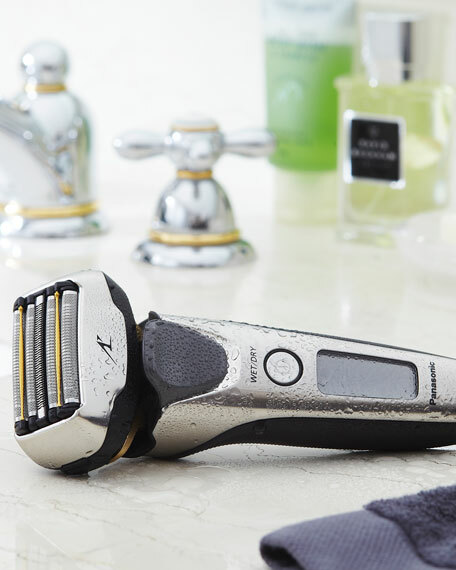 The smart, easy-to-read 10-stage LED in the handle makes it quick and simple to monitor shaver functions like battery power level, recharging status, travel lock on/off and more. Keep your blades ultra clean and the battery charged with the included high-efficiency automatic cleaning and charging system, and detergent cartridge. Powerful, precision 5-blade system for closer, gentler shaving. 3D Multi-Flex Pivoting Head flexes up and down, side-to-side and back-and-forth. ARC5 Skin Comfort Foil System ensures an exceptionally close shave. Beard Sensor automatically delivers even, consistent shaving. 14,000 cpm linear motor maintains peak performance throughout battery life. Use dry or in the shower with wet/dry convenience. Automatic premium cleaning and charging station and travel pouch included.